ABLE’s range of magnetic level gauges offer clear indication of liquid level in any chamber configuration required to suit process connections. Standard chamber designs or customised chamber configurations can be built on short delivery times to suit customer requirements. Standard options include switches, reed chain transmitters, magnetostrictive transmitters or insulation for cryogenic applications. Exotic chamber materials or economic ‘mini’ chamber versions, particularly for refridgeration applications, are also available. 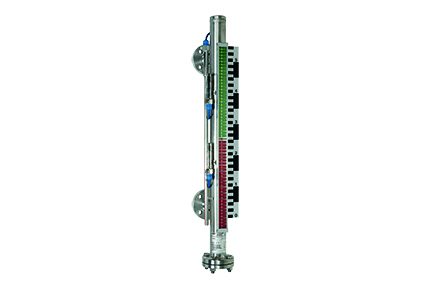 The ABLE magnetic level indicator incorporates a float which contains an integral magnet. The buoyant float rises and falls with the liquid or interface level whilst the magnet ‘flips’ the indication mounted externally to the chamber. The silver and red indication flaps represent air and liquid or the interface level respectively. The magnetic level indicators can be mounted in various orientations, typically onto the side or top of a vessel. ABLE also offer the ‘ABLE Fusion Level Gauge, which is the most advanced, accurate and reliable level measurement system that combines the operation of a float operated magnetic level indicator with a guided wave radar to offer two independent proven level technologies in one system. For more information, please click here.